Among our many solutions, you can use codeREADr to monitor the security and safety of your campus. Administrators can confirm patrols have been performed on schedule, monitor their routes and schedules, and issue reports to management and law enforcement officials in states of emergency. Perhaps most important, they can enforce good safety procedures. Guards scan a barcode label or NFC tag at every door, gate and lock to report the status in real-time. In this way, there are records used to highlight problem areas and to use for reporting purposes. Note: ‘Asset’ refers to doors, gates, locks, etc. Advanced – IT/Developer Integration: IT/Developers can seamlessly integrate codeREADr into their existing applications or their back-end using our extensive set of APIs. They can also use advanced features such as regular expression, contextual variables and Webify. A dual function QR code could work nicely here, too, so consumers could scan it to report any issues. Assets most often need to be labeled with a barcode (low cost) or an NFC tag (somewhat expensive, plus not all smartphones are NFC enabled yet). Alternatively, you could simply label each asset with a human-readable number for text/voice-entry. If you are using a validation database, you could use the apps Look-Up feature to search for the asset in the database – whether for hard-to-label assets or for all assets. It’s remarkably fast and accurate even when searching for the first few characters of the ID. However, to minimize error, using a barcode is ideal. For record-only services you’ll need to tag each asset with a QR code embedded with a number and or (ideally) a name (e.g., Fire Exit – Stairwell #3). 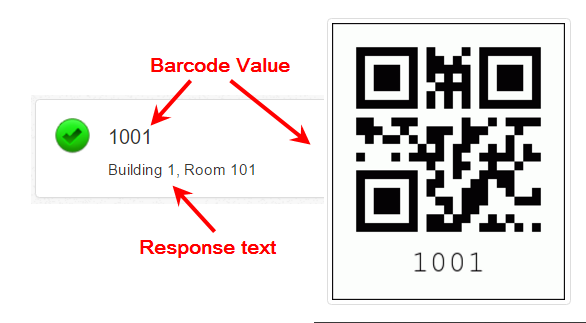 You can easily print QR labels using low-cost programs, such as iBarcoder for PC and MAC. You can also generate them with codeREADr on the Databases page. Alternatively you could use the barcode already on the asset or label it with another barcode type. With a validation service this is no problem because you would have already associated the asset ID (barcode value) to the asset name (response text) – see importing a CSV file. However, with a record-only service you have to associate the asset IDs with the asset name when you do your reporting. Unless you are familiar with Excel or other database programs, that might be a lot of work – hence the reason to use QR codes with a human-readable text for record-only services.